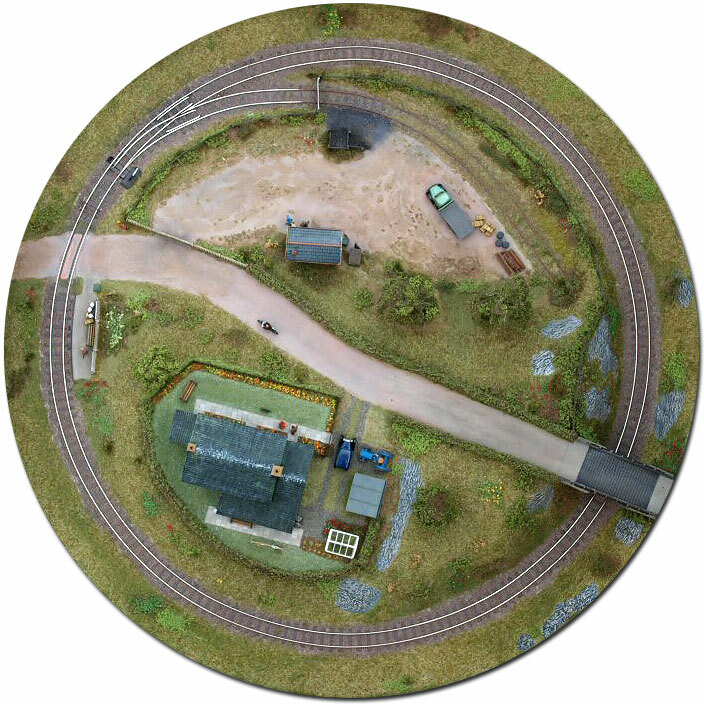 Several years ago, I saw a small model train layout on an Nn3 website that just clicked for me; as soon as I saw this layout, I knew I’d want a similar layout for myself someday. 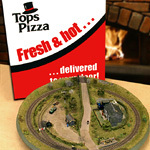 The layout is called The Pizza and the builder’s name is Mark Fielder from the UK. 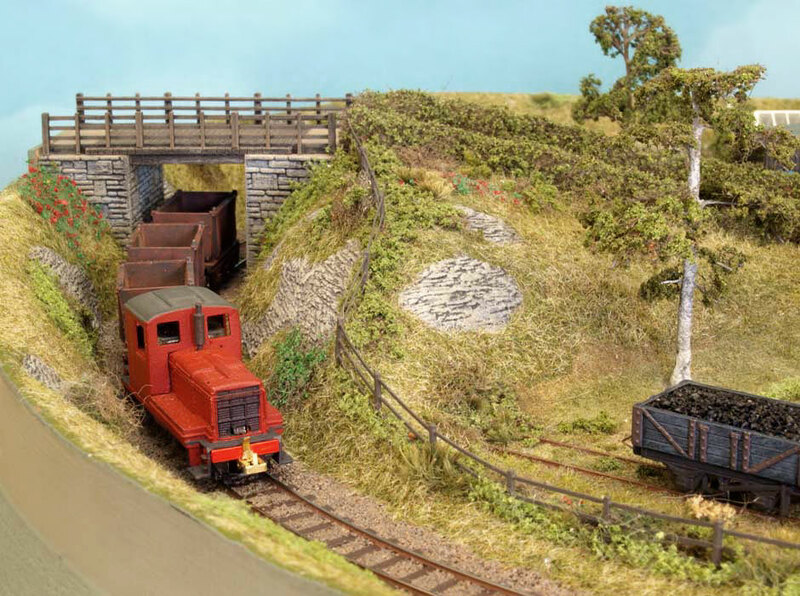 I’ve built many dioramas and desktop layouts since then and I thought it was about time I featured what I consider the original, the small layout that just knocked me out and had me look at small layouts in a different light. Mark has graciously agreed to share the story of The Pizza layout here at Raildig. 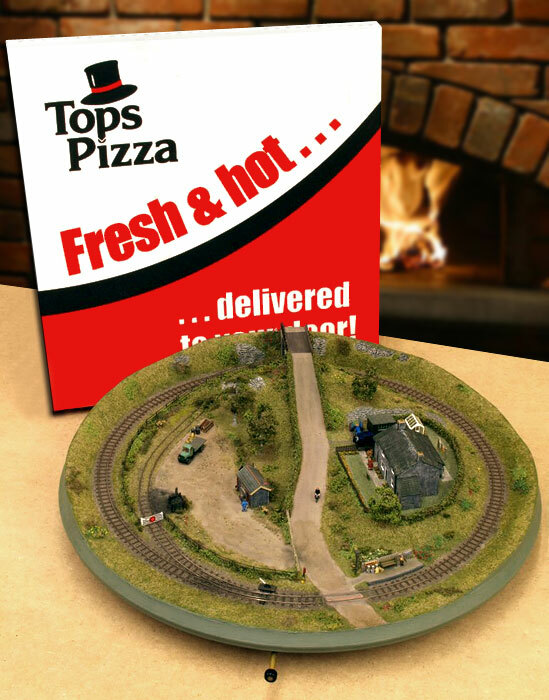 As John recently featured a video of my Nn3 “pizza” on the site, he thought readers might be interested to learn a little bit more about it and invited me to write this guest column. 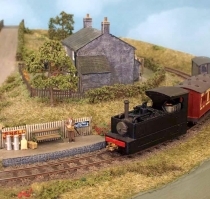 My friend Phil Copleston & myself have been regular exhibitors at UK narrow gauge modelling events, showing Nn3 & related scales. Initially, this was largely a static affair, often using borrowed models and we didn’t have anything to run. For ExpoNG in 1995 I resolved to have something running. As usual, I left it a bit late, so the weekend before the show saw me looking in my local home improvement store for a suitable baseboard. I found some machined MDF discs on sale, 400mm and 600mm diameter, intended for use as coffee tables. 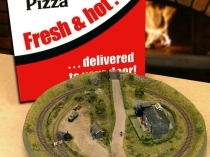 It occurred to me that I could lay a circle of 6.5mm gauge track around the periphery of the 400mm disc and make a nice little working display. 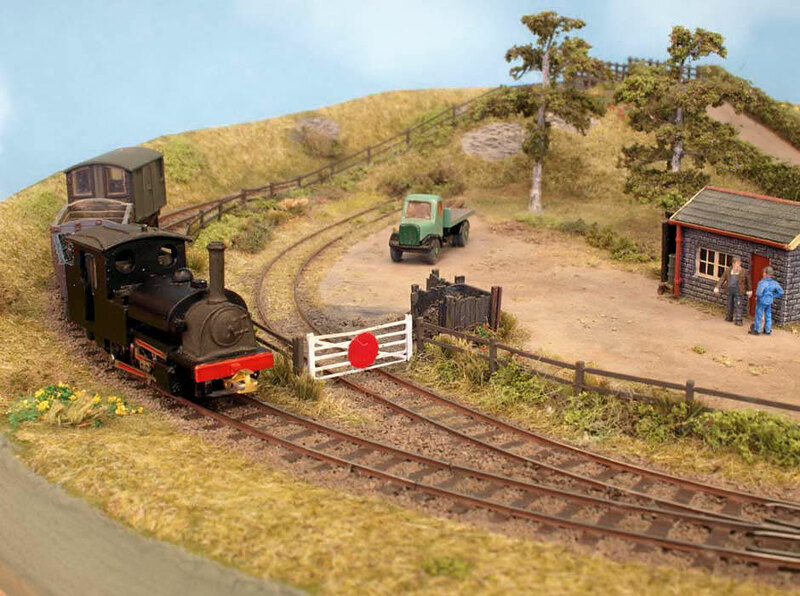 A week of evenings saw a loop of 6.5mm gauge track together with a turnout & siding in place and operational. Technically, the gauge is actually ¼ inch as I used a slice of Tufnol (a resin impregnated fabric material) as my track gauge. 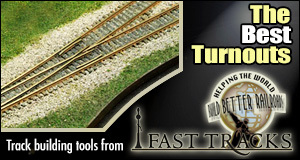 The track is made from 2mm Scale Association components (www.2mm.org.uk), cut down PCB standard gauge sleepers and code 40 rail. I find soldered track construction proceeds quickly as there’s no waiting for glue to dry. After the 1995 “ExpoNG” (http://expong.org/), some basic scenery with a vaguely Irish/IOM feel was put in place. 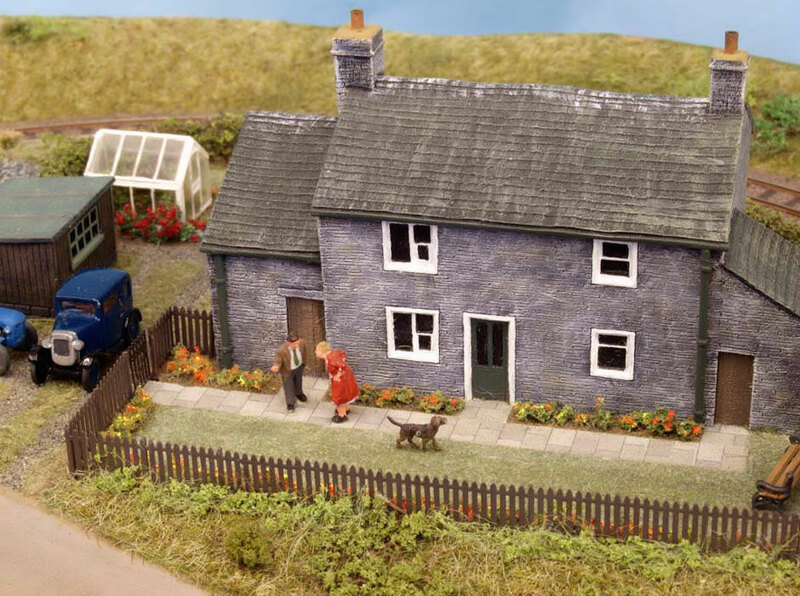 The editor of the Model Railway Journal donated a review sample of a cast resin farmhouse, so this was detailed, painted and placed in position. 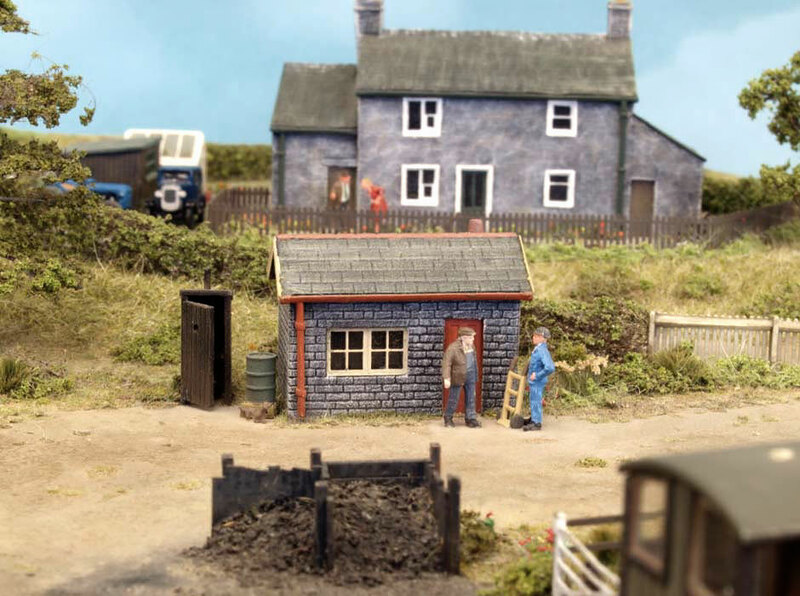 The siding became a small goods depot, protected by a gate: a feature that has always appealed to me Breaking up the layout into small scenes, a road was put in roughly bisecting the layout, featuring a bridge and cutting on one side and a level crossing on the other. The level crossing provided justification for a small adjacent halt. Basic texturing was done using various static grasses dispensed from a “Noch” puffer bottle. The variety of textures obtained was very pleasing and the layout showed British/Irish Nn3 was definitely a practicable option. 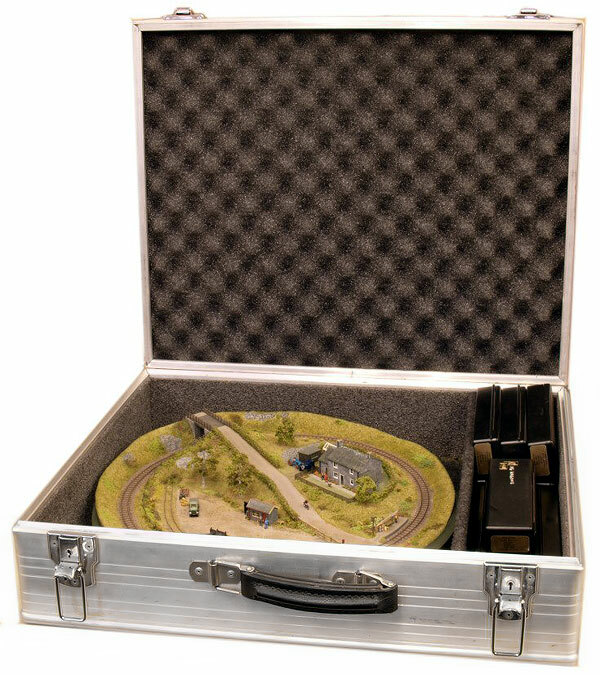 The layout remained in this state until early in 2000, when my USA friends on the Nn3 email list suggested that I might like to bring it over to the NMRA convention in San Jose as part of an Nn3 display, where they would be assembling the very first Nn3 modular layout. This gave me a strong impetus to bring the scenery up to the level seen in the accompanying photographs, so as not to let the UK side down. 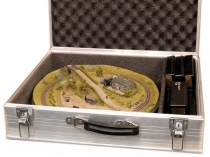 The 400mm overall size proved useful, as a friend who had a business making flight cases for musicians made me a robust purpose built case of the appropriate size for airline hand baggage. The San Jose trip was very enjoyable and it was great to put faces to names, which previously had been just email addresses. Later in 2000, I travelled to Expometrique in Paris via Eurostar, which was also a great experience and it was fascinating to see some of Nm work being done by AFAN. A second trip to the USA was made in 2002 to the Narrow Gauge Convention in Rhode Island. As this was on the anniversary of the 9-11 World Trade Centre attack, the layout and stock were given very close attention by airport security on both sides of the Atlantic! 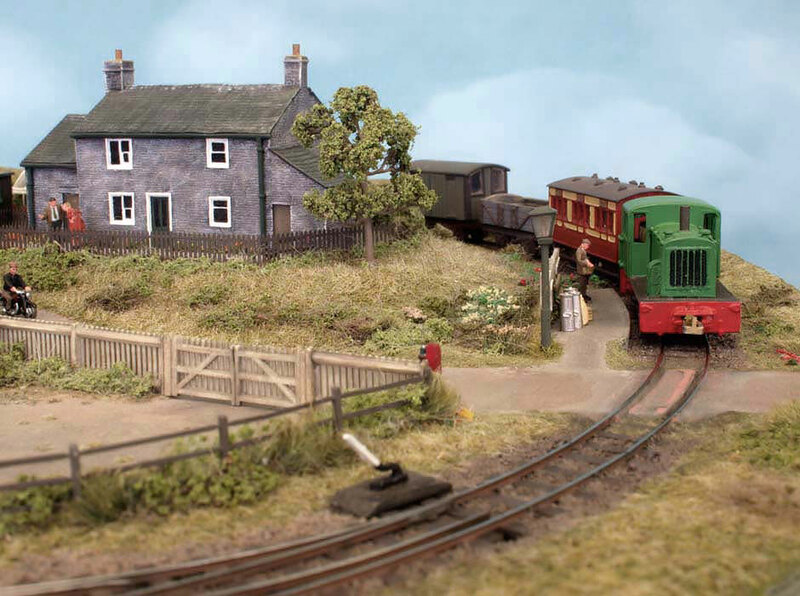 The layout also appeared on BBC television, as part of the publicity for one of the main UK model railway exhibitions. 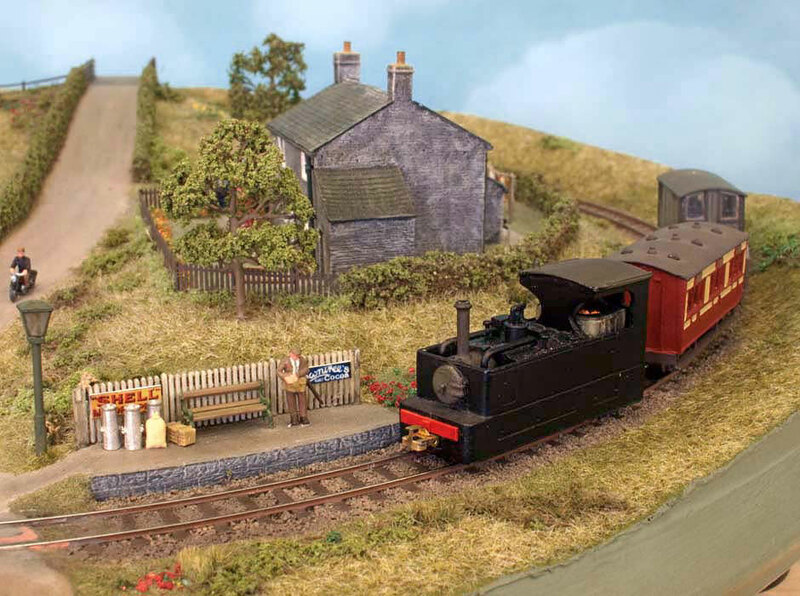 As the layout lives in its purpose-built case between shows, the scenery keeps clean, fresh and dust-free. The track also stays clean, which helps reliability. What I’ve found with Nn3 is that this scale allows you work in the tiniest space and still have a sense of distance. To aid this, I have kept the colour palette on the lighter, paler side, which I believe is vital in smaller scales. Viewed from low down, the layout has the sense of having a horizon. 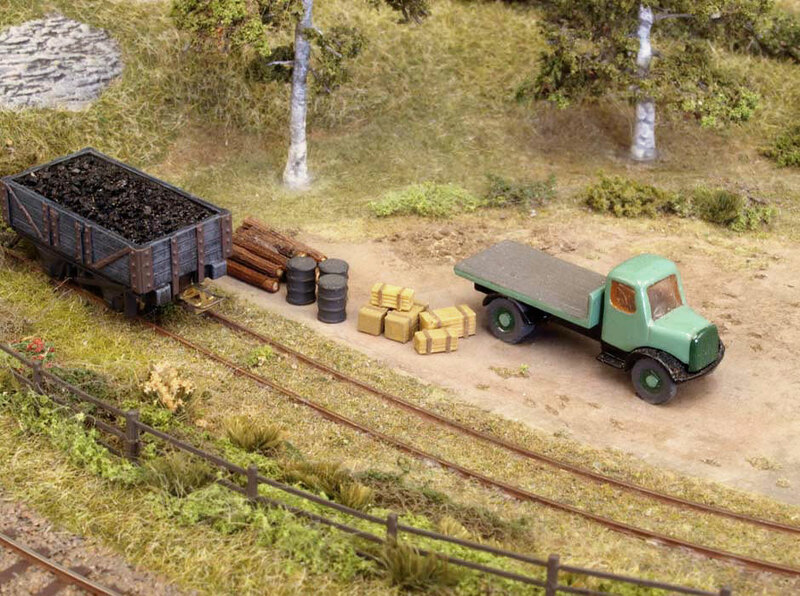 Most of the rolling stock that gets used on the layout originates from Peco. 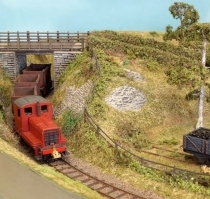 I have both of the loco kits, the freelance saddle tank and the Glyn Valley Tram loco. I also have locos from other sources, such as a Davenport diesel from Republic Loco Works. 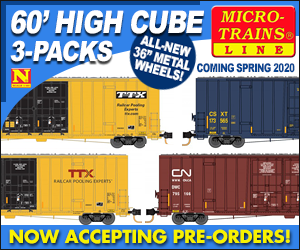 With a bit of ingenuity, it’s possible to build up a variety of Nn3 locos. The rolling stock is mostly the Peco plastic kits, built as intended or with small modifications. The solitary passenger coach is a converted N standard gauge model. Next time, I’ll cover the rolling stock in more detail. I hope you enjoyed this brief look at “The Pizza” – which never really gained a proper name as the nickname seems to now be indelibly stuck!